Austin Stilphen ~ "Mt. 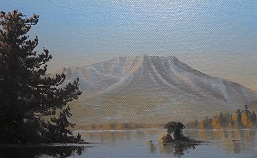 Katahdin from Ambajejus Lake" ~ Oil on Canvas 4.5" x 6.5"
PORTLAND, Maine - Aug. 22, 2018 - PRLog -- Richard Boyd Art Gallery opens an annual group exhibition of visual arts depicting imagery of Maine on Monday, October 1 at 10:00 a.m. The exhibit showcases the diversity of subject matter in Maine which has long been a source of inspiration for artists. On display are a selection of works in a variety of mediums and styles, depicting scenes from the interior, to the islands, coves, and working waterfronts in Maine. Each work is the artist's interpretation of a scene in Maine. The show includes original works by artists' Austin Stilphen - oil; Patricia Chandler - oil, mixed media and cold wax; Randy Eckard - watercolor; and Jane Herbert - acrylic. The exhibit is open free of charge between the hours of 10:00 a.m. and 5:00 p.m. daily through October 30, 2018. For more information about the exhibit please contact Richard Boyd Art Gallery by phone (207)-712-1097, via email at info@richardboydartgallery.com or visit the gallery's website at http://www.richardboydartgallery.com . Like us on Facebook at http://www.facebook.com/RichardBoydArtGallery . Image courtesy Richard Boyd Art Gallery.